The Git add-on can add repositories hosted on a Windows server or Windows network share. Add a new network share or Windows server hosted repository via the Connect to Git Repository wizard. The network credentials accessing the git repository must be the same as the user running Jira. The network path is not longer than 255 characters. The user under which Jira is running should at least have read access to network path. In the Git Repositories configuration page, edit the repository via Actions > Edit repository. 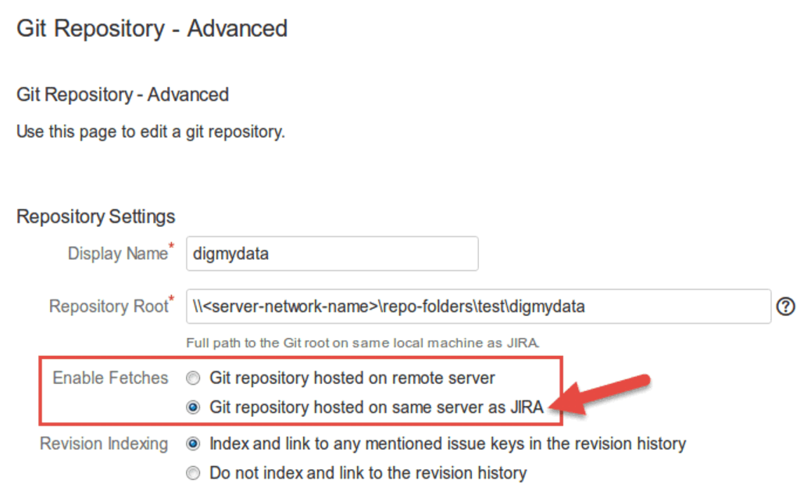 Under Repository Settings, set Enable Fetches option to Git repository hosted on the same server as Jira. Make sure that the network folder share name are correct and that the user has at least read access permissions to the network path.